Almost one year ago, Internet lighting retailer 1000Bulbs.com expanded their inventory to include a wide range of grow lights and hydroponic supplies. In the months since then, the company has experienced considerable success with hydroponics, becoming not only a one-stop shop for lighting, but for hydroponic and grow supplies as well. 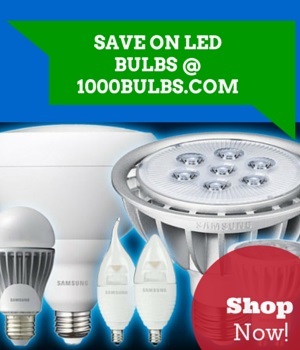 While 1000Bulbs.com has always carried grow lighting, such as HID and metal halide bulbs, its offerings now include all-in-one grow lighting systems, garden and growing accessories, reflectors, hydroponic systems, nutrients, grow media, and more. To ensure quality customer service, 1000Bulbs.com has brought in two indoor gardening experts to provide guidance on product selection and maintain strong relationships with vendors. With over 30 years of combined experience, these experts are able to answer any questions that customers may have regarding hydroponic and grow supplies. Currently, 1000Bulbs.com works with seven major suppliers that provide over 50 brands of grow lights, hydroponic supplies, and accessories that will cover any and all needs of casual vegetable gardeners and indoor gardening enthusiasts alike. These major suppliers include Hydrofarm, Advanced Nutrients, Can-Filters, Heavy 16, Sunlight Supply, California LightWorks, and CANNA. Whether someone is an expert or just a beginner, 1000Bulbs.com carries a large assortment of hydroponic systems for all levels of growing and gardening. Among these hydroponic systems are deep water culture, drip, ebb and flo, wick, and aeroponic systems. Quality hydroponic nutrients and supplements are also an essential component of any indoor grow project. With 24 brands to choose from, 1000Bulbs.com offers a large selection of nutrients to help cultivate their plants through all stages of the growth cycle. The company also offers grow media, such as soil, rocks, rockwool, stonewool, coco, clay rocks, and more, for use in hydroponic systems. For their grow lighting needs, customers will find grow lighting for all types of reflectors from trusted brands such as GE, Ushio, SunPulse, Hortilux, Ultra Sun, and Plantmax. 1000Bulbs.com offers metal halide grow lights, high pressure sodium grow lamps, incandescent, and compact fluorescent grow lights in a variety of lumen outputs and color temperatures to care for both the vegetative and flowering stages of plants. As a more energy-efficient option, a number of LED grow light fixtures are also available. Using less energy and running much cooler than their HID and CFL counterparts, LED grow lights are long-lasting with projected life ratings of up to 80,000 hours. Customers will be able to round out their setup with 1000Bulbs.com impressive selection of gardening and grow accessories. From measuring cups and syringes to light meters and thermometers, 1000Bulbs.com offers any tool that will aid in successfully monitoring and growing herbs, fruits, and vegetables. Feel free to leave a comment or reach out to us on Facebook, Twitter, Pinterest or Google Plus!